The design, construction and materials of masts, rigging and sails have changed greatly over the course of the 20th century. From solid wooden masts built from a single tree to carbon fibre sections aerodynamically tested, super light and super strong. For sails there have been developments from natural materials such as cotton, which had a tendency to rot and stretch when wet, to new materials such as North sails 3DL sails using Vectran, carbon fibre, Kevlar and exotic films and glues. A three-part article written by Jim Russell of AeroMarine Research which summarizes the main factors involved in tunnel boat design. Jim has written a number of books including Secrets of Tunnel Boat Design and History of Tunnel Boat Design and has also created the Tunnel Boat Design Program software. Hopefully you will find this three-part article to be an interesting introduction to the hydrodynamic and aerodynamic forces which must be carefully considered and skillfully balanced in the design of a high performance powerboat. For designers not already familiar with the intricacies of tunnel boat design, this article will provide a good starting point and will hopefully spark your interest. And I believe the more advanced designers among our audience will find this series of articles to be a great preview of the Books and Software from AeroMarine Research which continue to take tunnel boat and aerodynamic design much further. Part I provides an overview and discusses Lift. Part II describes the Drag = Thrust relationship. Part III looks at the necessary dynamic balance of forces. A fascinating article from Brian Eiland detailing his development of a sailing rig which discards the "inefficient mainsail, and replaces it with two clean leading-edge headsails, acting in a parallel, harmonious fashion" with a mizzen sail creatively added and the mast stepped aft in the cockpit area and canted forward 10 degrees. A cruising rig that is more aerodynamically efficient. A rig that allows the whole sail plan to be roller-furled away or deployed. A rig that allows the reefing of the sails without turning into the weather. A rig that divides up the total sail area into smaller manageable sizes. 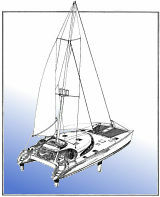 A rig that maintains its balance center (CE) with different sail combinations. A rig that produces less overturning moments. A rig that can be operated without leaving the cockpit. We believe that you will find both the developmental narrative and the concept extremely interesting. We would like to begin featuring design articles on a more regular basis covering a wide variety of subjects which would be of interest to professional designers, design students, and the general public as they select their next yacht or as they chose a designer and builder to realize their dream. If you are a designer, boatbuilder, or involved in the marine industry and would like to contribute an article to be included on , please contact us. To get the process started, we have come up with a preliminary topic list, but only to provide an idea of the type of articles we are interested in featuring. The following list is just a start. If you might be interested in contributing an article, we welcome your suggestions. What's the next evolutionary step for the catamaran or tunnel hull forms? VEC molding, CAD/CAM/CNC vs. traditional boatbuilding, the advantages of traditional materials such as wood and cold molded hulls, alternate homebuilding techniques, environmental concerns, vacuum techniques, the future of composite construction. Career Paths for a Naval Architect. A look at how a young Yacht Designers should get started, both in terms of theoretical and practical education and paths into the industry, small boatbuilders, custom one-off and limited production yacht construction. We would like to arrange to publish articles on a wide variety of subjects, certainly not limited to the above. In return, we will offer authors and contributors publicity (5000 page views per day), prominent links to your web site and/or contact information, and any web services which might be requested or required. We look forward to your input. * What makes the tunnel hull work?